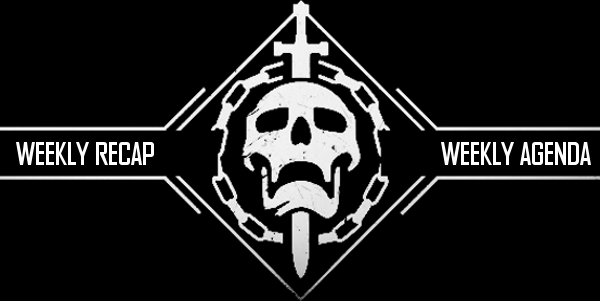 Last week was the release of TTK and it has been awesome. This expansion has amazing quality, a great story and the best raid experience I’ve had in a long time. It is easily and by far the best addition to Destiny since it released last September. If you don’t like it, there’s something seriously wrong with you. If you haven’t made it into the raid yet, you’re in for a treat! Alright, the strategy team has gone through the entire raid a couple times now and is confident enough to begin teaching the rest of the clan our tactics we will use starting this Tuesday at 7:00 PM EST. These are the teams we will use THIS week. Depending on how it goes in Team 2, we may make modifications for future compositions. Josh was set as a backup for Team 1 because unfortunately Warlocks are pretty weak in the raid and we can’t have two of them in one group. This is going to be quick and to the point - below is our current roster. 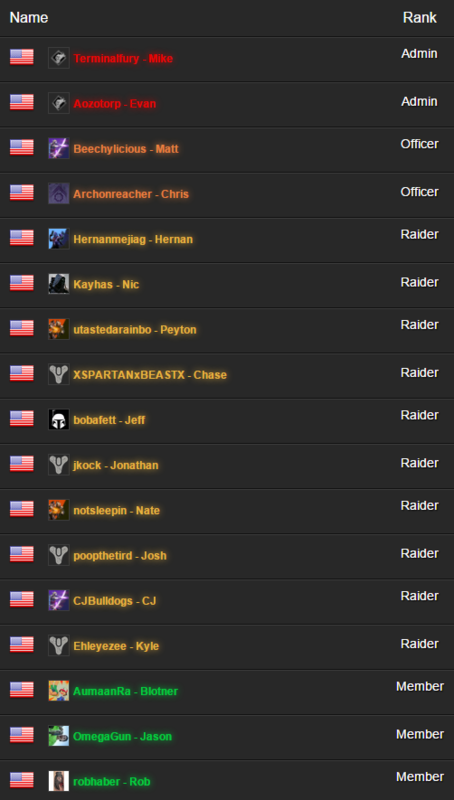 If your name is yellow or green (Raider/Member for the colorblind) please refrain from directing your fireteam in any capacity during raid. We utilize the chat on PSN to communicate IMPORTANT details while raiding. Your leadership will let you know what to do during each encounter. This doesn’t mean we want you guys completely quiet, but instead to only let us know IMPORTANT events. We don’t need to know if you’re synthing your primary or reloading your shotgun. When we all know the fights and can do them with minimal communication, we won't care what you all talk about during raid. The last thing I want to touch on is talking over each other. I get that there’s lag in the party chat sometimes and it can be easy to accidentally talk over someone. It’s another thing when you turn up your volume just to make a point, especially when you’re talking over someone in a leadership role - at that point, it's a lack of respect. The Admin and Officer ranks are in place for a reason. If you think you can do our jobs better, please go make your own clan and prove us wrong.